Preheat oven according to packet mix instructions. This cake needs to be baked in two batches. Prepare two of the packet cakes according to instructions and pour into lined tin. Bake according to instructions. Cool completely on a wire rack. Repeat with remaining two packet cakes. Level each cake with a knife. Place one cake on cake board and spread liberally with chocolate butter. Flip the second cake upside down and place on top of the first cake so that the cakeåÕs bottom is now the nice smooth top and place on top of the first cake. Place chocolate and butter in a microwave proof bowl. Heat at medium power for 30 second intervals, stirring between each interval. Repeat until melted. Cool to room temperature and then it is ready to use. Cream butter for 1-2 minutes. Add the milk, vanilla and half of the icing sugar. Beat for approximately 3 minutes. Add the remaining icing sugar and beat for another 3 minutes. The icing is ready to use straight away. Ice the entire cake with butter cream. It is difficult to make the edges clean on a rectangular cake but this can be hidden with the licorice. Measure the height of your cake and cut the licorice to the same length as the height of your cake. The easiest way to do this is to lay your ruler on a cutting board and unroll the licorice next to it. Use a sharp knife to cut. Place the licorice on the sides of the cake leaving a space of approximately 2cm between each piece. Start at a corner. To colour the coconut green, put the coconut into a bowl together with 4-5 drops of green food colouring. Wet your hands and shake until almost dry. Mix the coconut with your hands until the colour is evenly distributed. Sprinkle the coconut over the top of the cake. Lightly press the coconut into the cake so that it sticks. Cut the craft wire to various sizes and poke into the chocolate balls. The wire should be sharp enough to pierce through the chocolate. 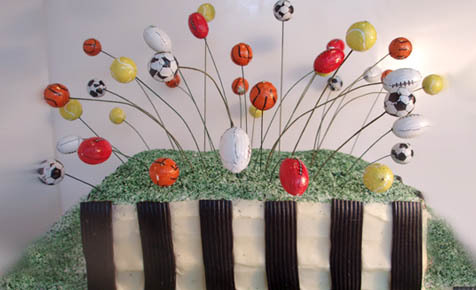 Poke each wired ball into the cake starting in the middle and working towards the outside. Bend the wire where desired. If you decide not to use packet mix, ensure you use a dense cake recipe like a mud cake as this will support the weight of the chocolate without tearing the top of the cake. Ensure your craft wire is strong enough to hold the chocolate. I used guage 20 wire (but you could use slightly less).